Since the plan of changing managers at Benfica was revealed in a leaked tape, the Portuguese press can’t stop talking about it. The conversation took place last year, when the Eagles were still looking to take Marco Silva from Watford. Still, newspapers believe that it’s the club’s intention to get rid of Rui Vitória soon. This Thursday, newspaper Correio da Manhã brings a story claiming that there are three options who Benfica are currently considering. And in case none of them works, then there are two backups. The three options would be Jorge Jesus, Leonardo Jardim and Abel Ferreira. Then in case the Eagles fail to get all of them, Marco Silva and Paulo Fonseca could be contacted. Correio da Manhã doesn’t bring any detail of how the plan goes, mostly because Rui Vitória still isn’t on the verge of being sacked. What we must say is that the list sounds a bit strange. 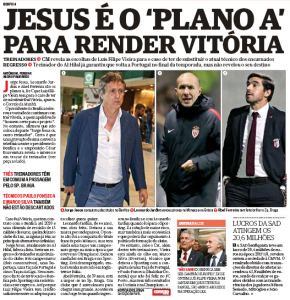 Jesus and Ferreira look like possible options, as the first should return to Portugal next year and Ferreira still needs a big job. But Jardim and Fonseca are building an international career, and these guys normally see a comeback to the home country as a step back. Regarding Silva, it’s needless to say that a man who’s already made a name for himself in the Premier League will hardly be moving to such place.